Khalil Fruzi Ferozi Ferozi in the late nineteen-nineties, working for the legendary anti-Taliban commander Ahmed Shah Massoud, sold emeralds mined in the crags of the Panjshir Valley and used the proceeds to pay an obscure Russian company to print truckloads of Afghan currency. In this way, he helped underwrite Massoud’s movement. But, according to a Massoud associate, the commander became enraged when he discovered that Ferozi was helping to print currency for the Taliban as well. Ferozi denied the story and went on to become Kabul’s most improbable C.E.O. With a body like an oil drum, and a retinue of gunmen around him, he prowls the streets of Kabul looking less like a banker than like a footballer lost in a war zone. Khalilullah Fruzi, who as chief executive heads Kabul bank's day-to-day operations is a former gem trader. Khurasan Security Services, which, according to registration documents, used to be controlled by Fruzi and is now run by his brother. Soviet Union. Fruzi is a shareholder (28%) of Kabul Bank. Fruzi got his education and his start in business there after Moscow invaded Afghanistan in 1979. Khalilullah Fruzi joined the Karzai Campaign during Presidential Election 2009 served as a financial adviser to Karzai's reelection campaign and also owns a house in Dubai. Also in London for the Afghanistan conference were Farnood, who now has an Afghan diplomatic passport, and Fruzi: "If there is no Kabul Bank, there will be no Karzai, no government," Fruzi said. (Washington Post 20100222) Top Afghan banking officials from Afghanistan Central Bank demanded , that Frozi and Kabul Bank Chairman Sherkhan Sher Khan Shir Khan Farnood Farnud resign, New York Times said. Afghan and U.S. officials concluded Frozi and Farnood engaged in reckless management of the institution, handing out millions of dollars to people connected to Afghan President Hamid Karzai and losing money on poor investments. Depositors have taken out $180 million in the past two days and Frozi, the bank's chief financial officer, said if withdrawals persist at that rate the bank may well fail. Among those under suspicion for allegedly receiving money from Kabul Bank are Finance Minister Omar Zakhilwal, Education Minister Farouk Wardak and former Interior Minister Hanif Atmar, Afghan and U.S. officials said. Sherkhan Farnood and Khalilullah Ferozi, the bank's former chairman and chief executive, had initially been held under a loose form of house arrest in Kabul but had now been taken into detention by the National Directorate of Security NDS (20110701). The restrictions on former Kabul Bank chairman Sherkhan Farnood, and former chief executive Khalilullah Ferozi, already appear to have eased. They were arrested and imprisoned this summer, but recently have moved to a day release schedule, and have even been seen eating in Kabul's only five-star hotel. 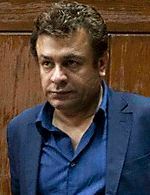 In June 2011 Ferozi told the Guardian that he would not co-operate on asset recovery if he was convicted of a crime. And in an email sent at about the same time, Farnood threatened to reveal "many cases and documents regarding· Mahmood Karzai and Karzai's family and their businesses. Hamid Karzai [knew] about these problems and deliberately did not assist to resolve, I believe he has political and financial interest," he wrote. (20111116) Fruzi and his Family are mostly living in Dubai, UAE. Fruzi speaks Dari, Pashtu, Russian and English.